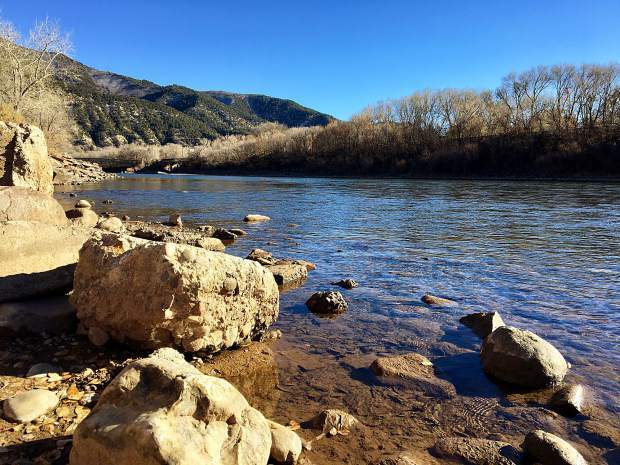 GOLDEN – The City of Glenwood Springs has paddled around the last of several big obstacles in its way to obtaining water rights for three potential whitewater parks in the Colorado River, at Two Rivers Park, Horseshoe Bend and No Name. Glenwood Springs made the crux move in its five-year journey Wednesday, when Aurora and Colorado Springs signed off on a “call reduction provision” in the city’s proposed water rights decree. The city made another key maneuver Thursday, when the directors of the Colorado Water Conservation Board agreed to amend a negative 2015 finding on the city’s water rights application, and agreed to settle with the city in water court. It also was announced Thursday that the Colorado River District and the town of Gypsum support the settlement in concept and are working on final approvals. Horseshoe Bend and No Name are not far upstream from downtown in Glenwood Canyon. They are on a Class II stretch of river below the Class III-to-Class IV Shoshone run. The highway is separated from the river at Horseshoe Bend, and there is an Interstate 70 rest stop next to the river at No Name. The city has previously obtained settlements in the water court case from the Bureau of Land Management, the Colorado Department of Transportation, Denver Water, Ute Water Conservancy District, Grand Valley Water Users Association, West Divide Water Conservancy District and the Glenwood Hot Springs Lodge and Pool. “This ends three years of really intense negotiations and collaborations with the applicant (Glenwood Springs) and a lot of work finding compromise and middle ground on this,” Pat Wells, general manager of water resources and demand management at Colorado Springs Utilities, told the CWCB on Thursday. So, for the bulk of the time, Glenwood’s new water right would make no difference on the river, as it is in the shadow of Shoshone. But the city wants to step out of that shadow and call for 2,500 cfs of water for 46 days, from June 8 to July 23. And, it could call for 4,000 cfs of flow on five days around the Fourth of July, in order to hold competitive boating events.